Gandhi said, “We all have a piece of the truth.” Ideally, we would use our diverse perspectives to build a home for all of humanity, a shelter under which we could grow our depth of understanding, and a place where our differences could be addressed and resolved. That vision has been shattered by those who profit from our animosity. The rubble of truth is full of broken pieces and dangerous slicing edges. We cut ourselves on half-lies. We shred our flesh on distortions of reality. Slivers of information lodge painfully under our skin and madden us into attacks. Shadowy figures shift the pieces into formations they want us to believe. The glass mosaics are, by turns, haunting, beautiful, seductive, horrifying, and enraging. They pile the pieces of their truths up into walls that seem like solid barriers of reality. We are prodded down cattle shoots of their creation. If we try to escape, we are met by politicians, pundits, or priests wielding long slivers of their particular points-of-view like swords. They slash and whirl in dizzying patterns of persuasion until we are distracted from our search for another path. Amidst all this, how do we move forward? A wrong step could kill us … and wrong steps seem to lie in every direction. Don’t wield your piece of the truth like a weapon; no matter how “true” you believe it to be. Hold it out, gently, like a dandelion blossom in your hand, for others to see and consider. Be skeptical. Be wary. Question everything. All pieces of the truth have reasons for their existence. Don’t discount them -though don’t take them at face value, either. Look for why each faction picks up their particular shard of reality. Understand the motives behind every person’s perspective. Question the patterns and mosaics of truth that people are building. What’s being left out? What’s being created? What is the reason this version of the truth is being built? Think about everything, but be careful about what you project into the world. We don’t need more half-truths and speculations flying about. Check your facts. Dig to the roots. Uncover the sources. Watch out for craftily worded ways that people twist the truth. Don’t be a cog in the gears of the rumor mill. Beyond approaching everything with a healthy degree of skepticism and examination, when we do move into action, be sure to put the heart first. Act in tangible ways to take care of people near you. Look after the well being of your neighborhood. Nourish and sustain life. Call for the end of violence and a peace that works toward justice. See human beings, not enemies. Withhold judgment. Things are never what they seem. 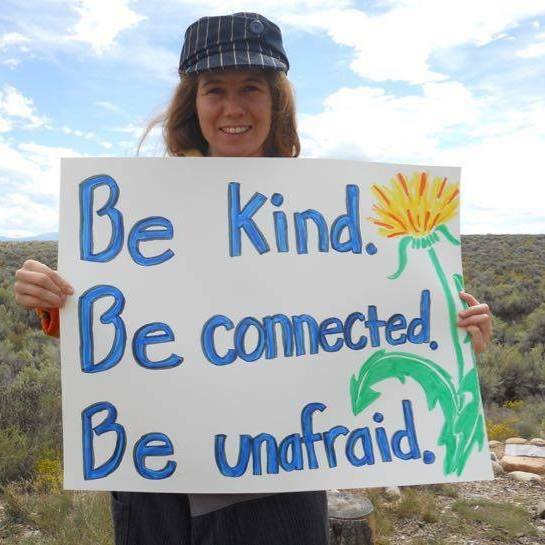 And as always, be kind, be connected, be unafraid! Share these ideas with others. Someday, we will rebuild our shared understanding of truth and reality … but we cannot do that in the midst of violence, riots, battles, and wars. So, our first step is to teach the Dandelion Insurrection and others to noncooperate with the warmongers who shatter reality into sharp weapons and manipulate us into using truth against one another. Using the tips we just mention, we must refrain from a violence built from shards of information and the sharp edges of lies. We have to all become conscientious objectors to the battle of perspectives. We can de-escalate the conflict by building our awareness and that of others. The shattered world is being used against us. It is time to reach for a deeper understanding of truth.